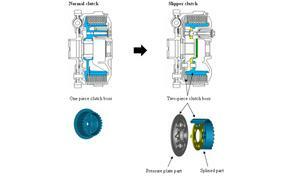 A ramp type slipper clutch, which absorbs the back torque forces transmitted from the rear wheel due to the engine braking forces. Launched on the 2006 R6 and R1-SP models. This slipper clutch ensures stability at corner entry as it will eliminate wheel hop when downshifting and helps maintain rear wheel contact with the road surface. The slipper clutch features a two-piece clutch boss, which will extend if the back torque forces the splined part of the boss towards the pressure plate. This will create space between the clutch plates. 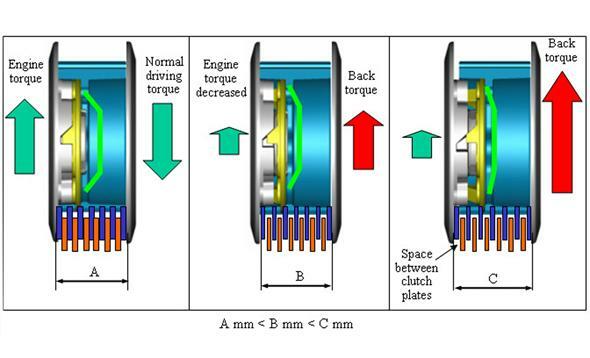 The back torque force of the rear wheel increases due to the engine braking forces. At a certain point, the ramp of the two-piece clutch boss will push the “Splined part of the two-piece clutch boss” away from the “Pressure plate part of the two-piece clutch boss”. This will push the pressure plate away. 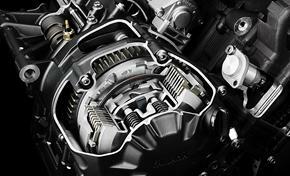 This movement will create space between the clutch plates and the back torque force on the rear wheel will decrease. The spring of the clutch plate will move the clutch boss back to its original position as soon as the engine torque increases.